"I-10" redirects here. For other uses, see I10. Interstate 10 (I-10) is the southernmost cross-country Interstate Highway in the American Interstate Highway System. It stretches from the Pacific Ocean at California State Route 1 (Pacific Coast Highway) in Santa Monica, California, to I-95 in Jacksonville, Florida. Major cities connected by I-10 include (from west to east) Los Angeles, Phoenix, Tucson, El Paso, San Antonio, Houston, Baton Rouge, New Orleans, Mobile, Pensacola and Jacksonville. This freeway is part of the originally planned Interstate Highway network that was laid out in 1956, and its last section was completed in 1990. I-10 is the fourth-longest Interstate Highway in the United States, following I-90, I-80, and I-40. About one-third of its length is within the state of Texas, where the freeway spans the state at its widest breadth. 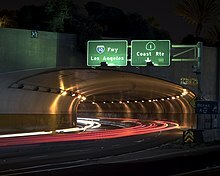 Between its west terminus in Santa Monica, California, and the major East Los Angeles Interchange, I-10 is known as the Santa Monica Freeway. The Santa Monica Freeway is also called the Rosa Parks Freeway for the segment beginning at I-405 (the San Diego Freeway), and ending at I-110/SR 110 (the Harbor Freeway). The segment between the East Los Angeles Interchange and the city of San Bernardino, 63 miles (101 km) long, is called the San Bernardino Freeway. Other names exist for I-10. For example, a sign near the western terminus of the highway in Santa Monica proclaims this highway the Christopher Columbus Transcontinental Highway. I-10 is known to a considerably lesser degree as the Veterans Memorial Highway, and it is listed as a Blue Star Memorial Highway. In Palm Springs, I-10 is also named the Sonny Bono Memorial Freeway as a tribute to the late entertainer who served both as the mayor and as a U.S. Congressman. Another stretch a short distance east in Indio is proclaimed the Doctor June McCarroll Memorial Freeway. In Arizona, the highway is designated the Pearl Harbor Memorial Highway. The portion through Phoenix is named the Papago Freeway, and it is a vital piece of the metropolitan Phoenix freeway system. This designation starts at Loop 101, near 99th Avenue, and it continues eastward to the interchange southeast of downtown which is the terminus of I-17. Near Buckeye, the freeway has mile markers posted every 0.2 miles from 112.2 to 110.8 with the interstate shield and direction of travel posted on the westbound lanes. On the eastbound lanes, mile markers from 110.8 to 112.2 do not include the I‑10 shield and direction of travel. 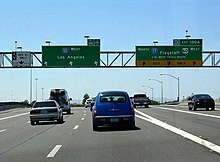 From the southern terminus of I-17 to the southernmost junction with Loop 202, the highway is signed as the Maricopa Freeway. This name holds true as well for I-17 from its southern terminus to the Durango Curve south of Buckeye Road. From Loop 202 south to the eastern terminus of I-8 just southeast of Casa Grande, the highway is declared the Pearl Harbor Memorial Highway. The Arizona Department of Transportation also has maps that show it as the Maricopa Freeway, while the American Automobile Association and other sources show it as the Pima Freeway. The latter's name is used on a stretch of Loop 101 from Loop 202 to I-17. Between I-17 in Phoenix and the I-19 interchanges in Tucson, I-10 is included in the federally designated CANAMEX Corridor, extending from Mexico City to Edmonton, Alberta. In Tucson, between I-10 mileposts 259 and 260 are interchange ramps connecting I-10 with the northern terminus of I-19. The highest elevation along I-10 occurs just east of Tucson, 20 miles (32 km) west of Willcox, at the mile marker 320 exit for the Amerind Foundation and Museum. The westbound lanes of I-10 briefly cross above 5,000 feet (1,500 m) above sea level. In New Mexico, I-10 more or less follows the former path of U.S. Route 80 (US 80) across the state, although major portions of old US 80 were bypassed in Western New Mexico's Bootheel and in Doña Ana County. I-10 passes through three Southern New Mexico municipalities of regional significance before the junction with I-25: Lordsburg, Deming, and Las Cruces. Most of I-10 in New Mexico, between Exit 24 and Exit 135, is concurrent with US 70. At Lordsburg is the western junction of US 70 and a concurrency; the two highways are joined all the way to Las Cruces. Several exits between Lordsburg and Deming are either for former towns (including Separ, Quincy, and Gage) or lack any town at all. At Deming is the western junction of US 180, which also forms a concurrency with I-10 all the way to El Paso. One mile (1.6 km) north of Deming on US 180 is New Mexico State Road 26 (NM 26) which serves as a short cut to north I-25 and Albuquerque. I-10/US 70/US 180 continue east to Las Cruces which is the southern end of I-25. US 70 leaves I-10 (prior to the junction with I-25), heading northeast to Alamogordo, passing through the north side of Las Cruces. The junction with I-25 occurs just south of the New Mexico State University campus, on the southern end of Las Cruces. I-10/US 180 becomes concurrent with US 85 at the junction with I-25. I-10/US 85/US 180 then turns south to the Texas state line, crossing it at Anthony. From the state line with New Mexico (at Anthony) to State Highway 20 (SH 20) in west El Paso, I-10 is bordered by frontage roads South Desert for lanes along I-10 East (actually headed south) and North Desert for lanes along I-10 West (headed north). The interstate then has no frontage roads for nine miles (14 km) but regains them east of downtown and retains them to Clint. In this stretch, the frontage roads are Gateway East for the eastbound lanes and Gateway West for the westbound lanes. All four frontage roads are one-way streets. Gateway East and Gateway West are notable, in particular, for TxDOT's liberal usage of the Texas U-turn at most underpasses of I-10 on this stretch. I-10 is the western terminus for Interstate 20, and the two highways intersect at Scroggins Draw, about 41 miles Southwest of Pecos, at mile marker 186. A small portion of I-10 from Loop 1604 to Downtown San Antonio is known as the Northwest Expressway or the McDermott Freeway, while another portion from downtown to Loop 1604 East is called East Expressway or José López Freeway. In Downtown San Antonio, it has a concurrency with Interstate 35, and throughout most of the northwest side of the city it has a concurrency with U.S, Route 87, which begins in Comfort, before turning off and heading east out of the city. Starting in San Antonio, it follows a more direct route of U.S. Route 90, with occasional small concurrences. 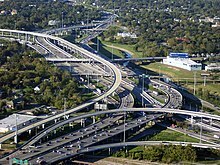 In Houston, from the western suburb of Katy to downtown, I-10 is commonly known as the Katy Freeway. This section has as many as 26 lanes (12 mainlanes, eight lanes of access roads, and six mid-freeway HOT/HOV lanes, not counting access road turning lanes) and is one of the widest freeways in the world. The space for the expansion was the right-of-way of the old Missouri-Kansas-Texas Railroad. The section east of downtown Houston is officially known as the East Freeway, although it is widely known by locals as the Baytown East Freeway due to a marketing push by Baytown, one of the largest cities in the Greater Houston Area. In Beaumont, it is known as I-10 South, south of Calder Avenue, and I-10 North, north of Calder Avenue. It is known as I-10 East from the I-10 curve to the Neches River, which is Beaumont's and Jefferson County's eastern boundary line. Orange County is on the other side. Continuing into Orange County and passing through the city of Orange at the easternmost end of Texas, and located at the base of the Sabine River Bridge is the last I-10 mile marker in Texas, number 880, before entering into Louisiana. In Lake Charles, Louisiana, a 13-mile (21 km) loop route signed as I-210 branches off of I-10 and goes through the southern portion of the city. In Lafayette, it serves as the southern terminus for Interstate 49. Shortly afterwards, there is an 18-mile (29 km) stretch of elevated highway between Lafayette and Baton Rouge known as the Atchafalaya Swamp Freeway, as it goes over the Atchafalaya River, across the Atchafalaya Basin Bridge, and the adjacent swamps. It crosses the Mississippi River at the Horace Wilkinson Bridge in Baton Rouge. Baton Rouge eastbound is the only portion of I-10 that is essentially one lane. After crossing the Horace WIlkinson bridge two lanes from I-110 South merge with two lanes I-10 East into three lanes with one of the Eastbound lanes quickly becoming an Exit Only lane. After delays, you are back to four lanes and the I-10/I-12 split. Interstate 12 links Baton Rouge to Slidell and bypasses I-10's southward jog through New Orleans by remaining north of Lake Pontchartrain. In New Orleans, a stretch of I-10 from the I-10/I-610 Junction near the Orleans-Jefferson parish line to the US 90/U.S. Route 90 Business (US 90 Bus) Junction is known as the Pontchartrain Expressway. A dip near the I-10/I-610 Junction, to travel under a railroad track, is one of the lowest points in New Orleans, and is highly susceptible to flooding. Pictures of water dozens of feet deep (several meters) during Hurricane Katrina are commonplace. Near Slidell, the final stretch of I-10 through the Mississippi state line is known as the Stephen Ambrose Memorial Highway. I-310 and I-510 are parts of what was slated to be I-410 and act as a southern bypass of New Orleans. I-610 is a shortcut from the eastern to western portion of New Orleans avoiding I-10's detour into New Orleans' Central Business District. I-10 in Mississippi runs from the Louisiana state line to the Alabama state line through Hancock, Harrison and Jackson counties on the Gulf Coast. It passes through the northern sections of Gulfport and Biloxi while passing just north of Pascagoula and Bay St. Louis. It also passes right south of the NASA Stennis Space Center. The highway roughly parallels US 90. The law defining the route of I-10 is Mississippi Code § 65-3-3. I-10 crosses over the border from Jackson County, Mississippi, and it goes through Mobile County in southwestern Alabama. In Mobile, I-10 is the southern terminus of I-65. In downtown Mobile, I-10 goes through one of the few highway tunnels in Alabama, the George Wallace Tunnel under the Mobile River. The speed limit of the eastbound approach is posted at 40 miles per hour (65 km/h) because of the sharp downward curve approaching the tunnel. The highway then crosses approximately 8 miles (13 km) of the upper part of Mobile Bay on the Jubilee Parkway, a bridge that local people call the "Bayway". The highway is next to Battleship Parkway. On the other side of Mobile Bay, the highway goes through the suburban area of Baldwin County before passing through Malbis, Loxley, and then on to the Perdido River to cross over it into Florida. Most of I-10 in Florida travels through some of the least-populated areas in the state. Much of I-10 west of I-295 in Jacksonville has only four lanes. 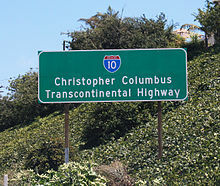 This sign in Santa Monica, California, declares that I-10 is the "Christopher Columbus Transcontinental Highway". While the highway has existed as far back as 1957, the last section of the entire route to be completed was a section of the Papago Freeway from both I-17 interchanges (including the Deck Park Tunnel) in Phoenix, which opened in 1990. Many widening projects have taken place on the interstate in the late 2000s. 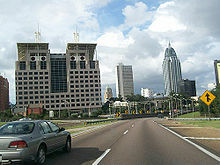 In Pensacola, Florida, a three-mile (4.8 km) stretch of I-10 was widened to six lanes in 2008. In Tallahassee, Florida, construction was completed in June 2009 on a project to widen a roughly 8-mile (13 km) stretch of I-10 to six lanes (eight in some places). In Tucson, Arizona, all exits between Prince Road and 22nd Street reopened after an extensive, three-year improvement project. I-10 was widened from six to eight lanes, and seven bridges and underpasses have been built to deal with congestion. I-10 from the Interstate 8 interchange in Casa Grande to Marana was widened from four to six lanes from the second half of 2007, to its completion in 2009. Also in Arizona, from Verrado Way in Buckeye all the way to Avondale, the interstate was widened throughout the late 2000s and early 2010s, with an HOV lane added between Estrella Parkway in Goodyear and Loop 101. Texas formerly shared the highest speed limit in the nation with Utah's test section of I-15. The speed limit along I-10 from Kerr County to El Paso County was raised by the Texas Legislature to 75 mph (120 km/h) in 1999 and to 80 mph (130 km/h) in 2006. However, the nighttime maximum speed limit remained 65 mph (105 km/h), and the daytime truck speed limit was 70 mph (115 km/h). With 70,000 miles (110,000 km) of highway in Texas, the 432-mile (695 km) stretch of I-10, and 89 miles (143 km) of I-20, between Monahans and the I-10 interchange at the cusp of the Davis Mountains, only a small percentage of roads were affected. On September 1, 2011, night-time speed limits were eliminated, and the statutory maximum speed limit in Texas was increased from 75 to 80 mph (120 to 130 km/h). As far back as the 1990s, Florida and Alabama have considered a connector that would link Dothan, Alabama, with I-10. In 2008, a proposal to make this new highway a toll road and to expedite its construction to complete it in five years surfaced. In 2012, federal funds previously set aside for the connector were allocated to other projects. In 2014, Florida sought bids for a feasibility study. Between August 27 and September 10, 2015, ten out of 11 Phoenix freeway shootings occurred on I-10. The last incident, on September 10, took place on Loop 202. In March 2019, Liverpool indie pop band Her's died alongside their tour manager after a collision on the I-10 near Salome. I‑5 in Boyle Heights; the highways travel concurrently through Boyle Heights. US 101 in Boyle Heights. US 95 in Blythe; the highways travel concurrently to Quartzsite, Arizona. SR 202 / SR 51 in Phoenix. US 191 north-northwest of Cochise; the highways travel concurrently to northeast of Willcox. US 70 in Lordsburg; the highways travel concurrently to Las Cruces. US 180 in Deming; the highways travel concurrently to El Paso, Texas. US 67 west of Fort Stockton; the highways travel concurrently to east-southeast of Fort Stockton. US 385 in Fort Stockton; the highways travel concurrently to east-southeast of Fort Stockton. US 83 / US 377 in Junction. I-10/US 83 travels concurrently to north of Segovia. US 87 in Comfort; the highways travel concurrently to San Antonio. I‑35 in San Antonio; the highways travel concurrently through Downtown San Antonio. I‑35 / US 90 in San Antonio. I-10/US 90 travels concurrently to west-southwest of Seguin. I-410 / SH 130 in San Antonio; the highways travel concurrently until east of Seguin. US 90 east of Columbus; the highways travel concurrently to Sealy. US 90 in Sealy; the highways travel concurrently to west-southwest of Brookshire. US 90 in Katy; the highways travel concurrently to Houston. I‑45 in Houston; the highways travel concurrently, but on different lanes, through Houston. US 69 / US 96 / US 287 in Beaumont; the highways travel concurrently through Beaumont. US 90 in Beaumont; the highways travel concurrently to Toomey, Louisiana. US 90 west-southwest of Westlake; the highways travel concurrently to Lake Charles. US 90 on the Theodore–Tillmans Corner line. ^ a b "Table 1: Main Routes of the Dwight D. Eisenhower National System of Interstate and Defense Highways as of October 31, 2002". Route Log and Finder List. Federal Highway Administration. ^ "Louisiana Interstate Highway Log". Southeastroads.com. October 31, 2002. Retrieved November 27, 2011. ^ Florida Department of Transportation. "GIS data". Florida Department of Transportation. Archived from the original on September 17, 2008. ^ Texas Department of Transportation. "Schematic Layout: IH 10 Katy Frwy, IH 10 at Bunker Hill Road" (PDF). Texas Department of Transportation. Archived from the original (PDF) on December 9, 2014. ^ Google (January 28, 2013). "Interstate 10" (Map). Google Maps. Google. Retrieved January 28, 2013. ^ "District Three Construction". Florida Department of Transportation. October 19, 2006. Archived from the original on June 5, 2008. Retrieved November 21, 2006. ^ "Project Descriptions". Florida Department of Transportation, Escambia County. Archived from the original on August 1, 2015. Retrieved November 21, 2006. ^ "I-10: Project Description". Moving I-10 Forward. Florida Department of Transportation. Archived from the original on August 1, 2015. Retrieved November 21, 2006. ^ "Texas Raises Rural Speed Limits to 80 MPH". Fox News. ^ "Dothan to I-10 Connection". West Montgomery, AL: WSFA-TV. January 25, 2008. Retrieved November 27, 2011. ^ "I-10 Connector Funds Released to Other Projects". Panama City, FL: WJHG-TV. September 4, 2012. Retrieved December 10, 2015. ^ "I-10 Connector Back on the Table". Dothan Eagle. March 12, 2014. Retrieved December 10, 2015. Wikimedia Commons has media related to Interstate 10.